"Hatter" redirects here. For other uses, see Hatter (disambiguation). "Milliner" redirects here. For people named Milliner, see Milliner (surname). Hatmaking or millinery is the design, manufacture and sale of hats and head-wear. A person engaged in this trade is called a milliner or hatter. 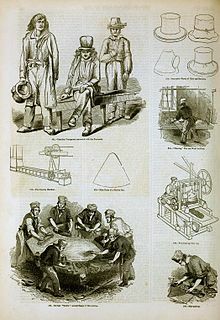 Millinery is sold to women, men and children, though some definitions limit the term to women's hats. Historically, milliners, typically female shopkeepers, produced or imported an inventory of garments for men, women, and children, and sold these garments in their millinery shop. More recently, the term milliner has evolved to describe a person who designs, makes, sells or trims hats primarily for a female clientele. The origin of the term is probably the Middle English milener, meaning an inhabitant of the city of Milan or one who deals in items from Milan, known for its fashion and clothing. Many styles of headgear have been popular through history and worn for different functions and events. They can be part of uniforms or worn to indicate social status. Styles include the top hat, hats worn as part of military uniforms, fedora, cowboy hat, and cocktail hat. A great variety of objects are or formerly were used as trimmings on women's fashionable hats: see Trim (sewing)#See also. In former times use of colorful bird feathers and wings and tails and whole stuffed birds as hat trimmings led to the formation of the Royal Society for the Protection of Birds (RSPB). This link, with references to 1880s newspaper issues, describes as ornaments on fashionable hats, bird feathers, and stuffed birds and other small animals, and fruit, flowers, ribbons and lace. 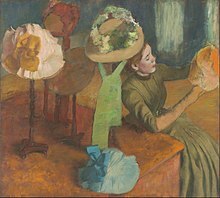 It says that in 1889 in London and Paris, over 8,000 women were employed in millinery, and in 1900 in New York, some 83,000 people, mostly women. It also described a fashion for stuffed kittens' heads as hat ornaments in or around 1883 in Paris (France), often posed looking out from among foliage and feathers, to the point where some people were reported to breed kittens for the millinery trade. International Hat Company, an American manufacturer credited with inventing one of America's most popular early 20th century harvest hats for field hands, farmers, and workmen. Hawley Products Company, an American manufacturer credited with inventing the tropical shaped, pressed fiber sun helmet used from World War II through the Persian Gulf War. Giuseppe Borsalino, with the famous "Borsalino" Fedora hat. Anna Ben-Yusuf wrote The Art of Millinery (1909), one of the first reference books on millinery technique. Rose Bertin, milliner and modiste to Marie Antoinette, is often described as the world's first celebrity fashion designer. Coco Chanel: Creator of the fashion house, Chanel, and creator of Chanel No.5. John Boyd was one of London's most respected milliners and is known for the famous pink tricorn hat worn by Diana, Princess of Wales. Stephen Jones of London, is considered one of the world's most radical and important milliners of the late 20th and early 21st centuries. Barbara Pauli was the leading fashion milliner and modiste in Sweden during the Gustavian era. Philip Treacy Irish-born award-winning milliner; first milliner for 80 years to be invited to exhibit at the Paris haute couture shows. ^ "Milliner". Merriam-Webster. Retrieved 2012-06-07. ^ "WHEN KITTENS' HEAD HATS WERE ALL THE RAGE". messybeast.com. ^ Steele, Valerie (2010). The Berg Companion to Fashion. Berg. pp. 72–73. ISBN 1847885926. Retrieved 9 June 2012. ^ "Mr. John, 91, Hat Designer for Stars and Society". 29 June 1993. ^ Hillier, Bevis (13 October 1985). "Hat Trick". LA Times. Retrieved 24 January 2013. This page was last edited on 7 February 2019, at 02:57 (UTC).